You're in our good hands. It's not just "stuff"... it's YOUR stuff! We honor your possessions; we work with you side-by-side to determine the disposition of them. We recognize the emotional attachment some clients have to some personal items and we help you through the decisions. We are judgment free and compassionate. 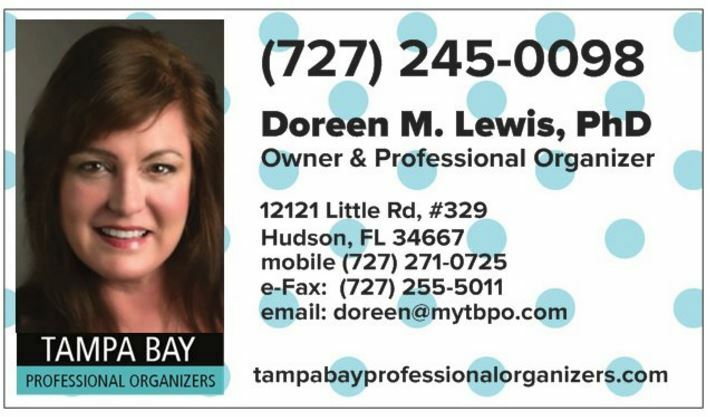 Tampa Bay Professional Organizers (TBPO) is a licensed, bonded, and insured company registered with the Florida Department of State since 2017. Owner Doreen Lewis is a member of the National Association of Professional Organizers (NAPO). We are a preferred provider of Home Advisors. Doreen Lewis, PhD, is is a professional organizer who holds a doctoral degree in psychology, as well as certification as a life coach. Doreen is semi-native to Florida, originally from Woodhaven in Queens, New York. Formerly, Doreen worked in marketing in the healthcare field, she also taught social sciences at several area colleges, served city government, and is a book author plus researcher published in scientific journals. She holds a current (voluntarily inactive) real estate license in the State of Florida. Doreen has been in the Tampa Bay area since childhood and has two grown children also in the area. TBPO is a growing business with a vision to help people of all walks to find joy in their lives by living more simply and organized. TBPO follows a business model that includes psychologist-led one-on-one organizing services and, wherein appropriate, utilizes a team of organizers (for large jobs). All TBPO team members are "like family". We recruit and screen only the finest candidates and we pay them well so that they will stay with us a long time. (If you're interested in working for us, please check out Jobs section of the website). TBPO is also a God-loving organization that contributes a portion of profits to local charities. We seek events and opportunities to be part of the community at-large, so please contact us if you would like to invite us to participate in your effort, or if you need a guest speaker. We are professionals you can count on! All TBPO Team members are trained in the TBPO methods of organization, and on the psychology of emotional attachment, grief, and other customer services skill areas. All TBPO employees have been background checked, are drug-free, and are of good moral character. We subscribe to the ethical codes outlined by the National Association of Professional Organizers (NAPO). 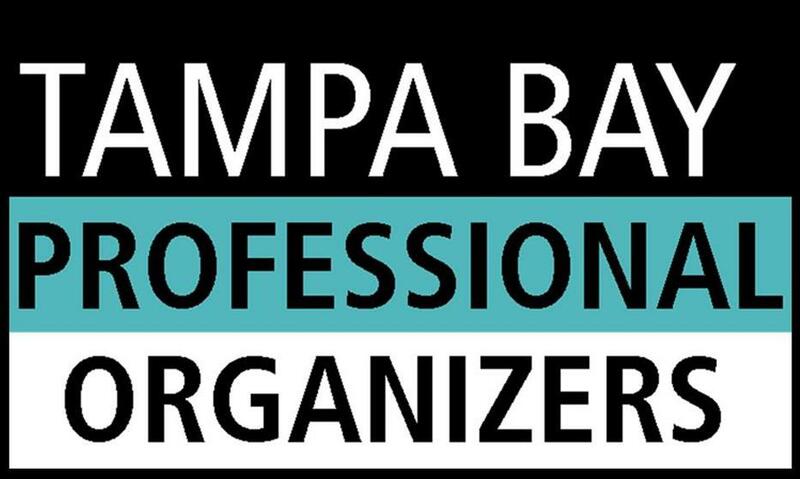 All Tampa Bay Organizers are licensed, bonded & insured. We think that employees are one of our finest assets. They serve as ambassadors to the company name and they reflect the important values we espouse in all the work we do. It is my pleasure to work with clients to help them simplify their life. This is a relationship business. You're inviting me into your home.... into your closets and under the bed, through boxes of treasures, and messes, too. It's essential to form a trusting bond with your personal organizer. My foremost goal is to establish a level of comfort and trust BEFORE any appointment is made. A short phone call is the first step for introductions and a short discussion about what services you need. We'll outline the next steps together so that there are no surprises. Please take a look at our Services Page to acquaint yourself with our many offerings and rates. I look forward to receiving your call!